Farm Girl Adventures: Only in North Carolina! 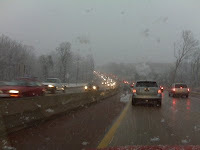 Last week as I was driving back from Charlotte, we got hit with a winter storm. As I was driving into Winston-Salem, the flakes started falling. 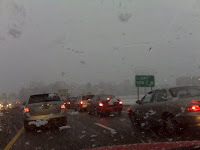 There was not enough accumulation to build up on the road, so it must have been the sheer disbelief that was causing people to drive on US-52 at five miles an hour! So we all cruised through town, foot on brake, watching the snowflakes hit the windshield. 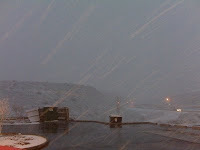 By the time I got back to Smith-Reynolds Airport to turn in my rental car, the snow had started accumulating on the ground. 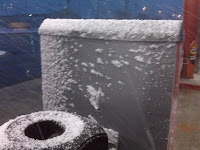 As I was pumping gas I noticed how big the flakes were and had to take a couple more pictures. It sure was pretty to look at. John and I were talking about it being the best location for weather. We get just enough of the white stuff but not too much. We can drive into the mountains and find snow and we can go skiing. 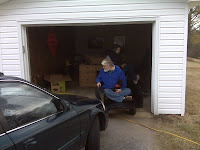 Last weekend, John and I went to visit Tim at his place in North Wilkesboro. We got there after lunch on Saturday and set up camp. Tim grilled us up some burgers for dinner and we sat down to watch a movie in the den. Rei curled up to watch with us. 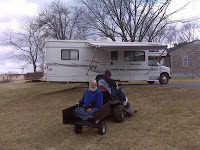 Sunday morning John and Tim headed out to the garage to put together his yard wagon. 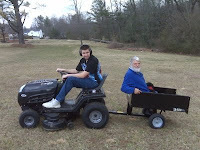 Now he can drive his riding mower down the street to fill up his gas cans! Here he's giving John and Toby a little ride! Then we helped Tim get his guest room TV moved from the garage to the basement. We also transported the new desk, the chair, a sander, sandpaper, and a couple of cans of stain for him to pick from. Now he can spend some time refinishing his desk when the weather warms up a little. Oh what I would do for a little snow. It is 80 here today! Just not right.